The Lake of Como (Latin name: “Lario”) is located in Northern Italy, in the Lombardy region. With a surface area of 145 km2 (56 sq mi) and a maximum depth of 410 m (1300 feet), besides being the deepest lake in Italy (deeper than most of the Adriatic Sea and all the great lakes of North America), it is also Italy's third largest lake and boasts the most developed coastline (170 km). The lake extends lengthwise for 46 km as the crow flies (60 km by road) and reaches a maximum width of 4.3 km. The town of Laglio is located at the narrowest point of the lake (650 m). In 2014 the American newspaper The Huffington Post ranked Lake Como as the most beautiful lake in the world, followed by a Canadian lake. 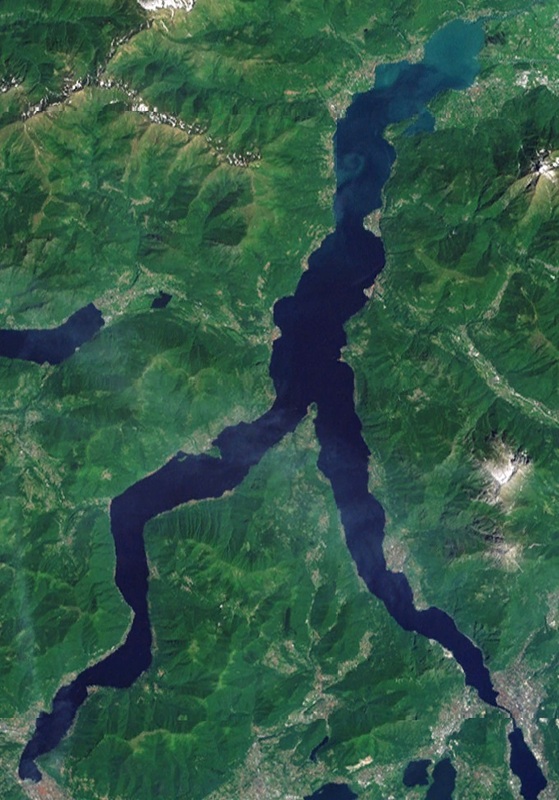 Lake Como formed around 20,000 years ago during the last glacial epoch. It has a distinctive upside down Y shape spreading northwards that splits into three branches: the Como branch (southwest), the Lecco branch (southeast) and the so-called “upper lake” (north). The point where the three branches intersect is known as the “center” of the lake or Triangolo lariano. The entire coastline is surrounded by mountains, the southern shore being characterized by inlets as opposed to the more open landscape, typical of the northern shore. Also, a difference in cultural terms can be noted when comparing the area around Como and Menaggio with the northern region, the former strewn with elegant villas and hotels and the latter, where a more modest atmosphere prevails, with a landscape dotted with camping sites and small windswept beaches. The lake has so far been spared by mass tourism and is still partly reminiscent of Romanticism, when, in the 1800s, many aristocratic families would host writers, poets and musicians who had elected the Como area as their preferred retreat due to its proximity to Milan. Generally speaking, due to its “introvert” beauty, Lake Como is rather reluctant to respond to the tantalizing appeal of modernity and tourist requalification. For example, an entertainment park like Gardaland (Lake Garda) would be totally out of line here. At the same time, the density of residential development clashes against the pre-existing balance between architecture and nature. You can see opulent villas standing side by side with typical picturesque towns that still retain a genuine and almost demure aspect. From a social standpoint, it is worthy noting how the territory stands between two extremes: On the one side, international tourism, that makes it open to the world and, on the other side, the character of its inhabitants, which is tendentially shy and introvert. Speaking of foreign tourism, Lake Como sees a major presence of UK visitors (mostly in Cadenabbia). The area is also popular with German tourists, but to a lesser degree. Americans started to arrive during the 1900s and soon regarded Bellagio as the place “most dear to their heart”, thus making this stretch of Italian territory the most cherished among them (the imposing, world-renowned hotel called Bellagio can be found in Las Vegas). Today Lake Como is becoming increasingly popular with Russian and Chinese tourists. Lario is also the only lake in Italy to lap two towns: Como and Lecco (the inhabitants of the major towns surrounding Lake Garda and Lake Maggiore do not exceed 30,000 persons). These towns, located at the southernmost tip of the lake, seem to clash at first glance with the poetic suggestion that mainly catches the imagination. Actually, Como and Lecco have not yet solved the contradiction between its tourism sector and its manufacturing industry, even though the partial decline of the latter in favor of the tertiary sector is now a matter of fact. As curious as it may sound, the lake starts at the northern end where its major tributaries enter, but it is customary to consider the southern end (close to the towns) as the actual lake starting point. Also, thanks to the orientation of the north basin, the sunset can be enjoyed from the eastern shores of the Lake, while the western shores wake up every morning to the first rays of sunlight. Lake Como is famed for its grand, historic villas surrounded by luxuriant parks. The southeastern shore is the most visited, especially the western bank. Sites worth visiting surely include: Villa Olmo in Como (open to the public during art exhibitions), Grand Hotel Villa d'Este, Villa Pizzo and Villa Erba (the latter is open to the public during events and conventions) in Cernobbio, Villa Passalacqua in Moltrasio, Villa Cassinella (widely regarded as the most beautiful villa in the world, available for vacation rentals) and Villa Balbianello (famous for being used as the backdrop of several Star Wars scenes) in Lenno. Also, Villa Carlotta and Villa Sola Cabiati (available for vacation rentals) in Tremezzo, Villa La Collina in Griante, Villa La Gaeta in Acquaseria, just to mention some. Numerous smaller villas are interposed between these outstanding residences (i.e. George Clooney’s villa in Laglio). On the eastern bank sits Blevio with its magnificent villas, Torno, with the legendary Villa Pliniana (visible only from the lake), Villa Lucertola (available for vacation rentals) in Lezzeno, and in Bellagio Villa Melzi and Villa Serbelloni (seat of the Rockefeller Foundation - visits subject to prior reservation). On the Lecco branch, Villa Monastero in Varenna completes the list of the historical villas open to the public. The picturesque hamlets, so typical of Lake Como, are concentrated for the most part on the southwestern branch. Particularly characteristic is the eastern shore of this branch, along the Como-Bellagio road, where you can see clusters of ancient buildings perched between the lake and the mountains, reachable by steep stairways that preclude motor vehicle traffic. The towns of Torno, Careno, Pognana and Nesso are definitely worth visiting. Brienno and Colonno sit on the opposite shore, whereas Bellagio, Varenna, Corenno Plinio and Rezzonico lie further north. Rezzonico in summer resembles a typical Ligurian hamlet, with a portico that opens up to the horizon and cliffs brushed by the afternoon sea breeze. Corenno Plinio, surrounded by the castle walls, resembles a jewel immersed in the memories of a thousand-year old history. Lake Como features five extraluxury hotels, namely, Grand Hotel Villa d'Este (Cernobbio), Grand Hotel Tremezzo (Tremezzo), Grand Hotel Villa Serbelloni (Bellagio), Casta Diva Resort (Blevio) and Villa Pliniana (Torno). These magnificent buildings, designed in a retro style, still retain the classic atmosphere of the Belle Époque. Four star hotels are found in the main towns. Como features a large number of four star hotels. Casino in Campione d'Italia, on Lake Lugano. The upper lake area offers numerous amenities for adventure lovers. Cremia, Pianello, Musso, Dongo, Gera and Sorico feature long esplanades that skirt the lake waters, while up north, the Mera River crosses the natural oasis of Pian di Spagna and flows into the lake of Mezzola. In Colico, bike rentals and horse riding schools can be found along the path that runs alongside the Adda River (Ranch El Picadero). Further down towards Lecco (eastern shore) the Bay of Piona opens up in full view (the use of motor boats is forbidden here). Take some time to explore the impressive rocky gorge of Bellano formed by the waters of the Pioverna River. Heading south, the shoreline that stretches from Como towards Bellagio is characterized by wild woodlands, beautiful but inaccessible; the road climbs high up into the mountains and if you want to explore the lakeside, it is better to rent a boat. Conversely, the southwestern shore is highly developed and is dotted with an almost uninterrupted sequence of villas and private gardens. Speaking of beaches, it should be reminded that Lake Como is characterized by deep and craggy shorelines. Beaches. The upper lake area is scattered with small pebbly beaches; the mountains here are more distant and leave space for a small expanse of flat land (Pianello, Cremia, Dongo, Domaso, Gera, Colico, Dervio and Bellano). The wide beaches of Onno (equipped with deck chairs and beach umbrellas, Pareo Beach), Lierna and Abbadia are located on the Lecco branch. The shores of Loppia (Bellagio) and Maiolica (Cadenabbia) are well worth a stop. As you drive along the road, most beaches are hidden from sight; it’s all up to you to discover them! Lovers of water sports (especially young people) will have no difficulty finding what they are after in the upper lake region. Gales are frequent and certain aspects of this territory recall a maritime atmosphere. The wind that blows every summer afternoon attracts many windsurfers from Northern Europe. Typical lakeside campsites, very popular among Dutch and German tourists, are found in Menaggio, Cremia, Pianello, Dongo, Domaso, Gera, Colico, Piona and Dervio. Sailing schools and kayak rentals are also available at these sites. The offer of B&B accommodation has significantly increased over the past years. New facilities have sprung up almost everywhere (B&B in Como city, Airbnb in Como city ). 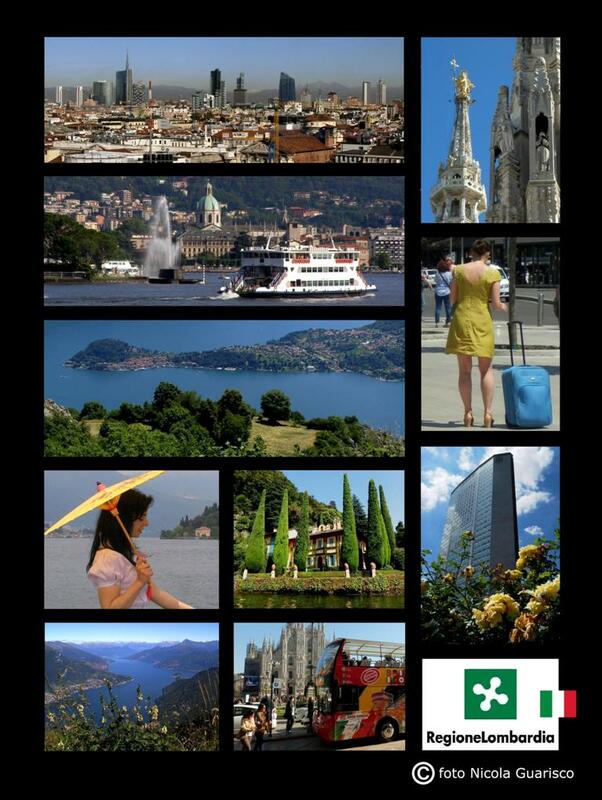 Hostels are found in Como, Lecco (Olginate), Menaggio (recommended as it is equidistant from all lake points). Rental points for boats that do not require a boating license can surely be found in Cernobbio, Moltrasio, Ossuccio (slightly beyond the famous bell tower), Lenno, Menaggio, Domaso and Faggeto. Ancient wooden row boats are available for rental in Moltrasio. Electric boats in Colico. Taxi-boat services for weddings and private excursions can be booked at the main hotels and major localities. Bellagio, Bellagio (Loppia), Menaggio, Varenna, Como, Lecco. The only island in Lake Como is Isola Comacina. It is deserted and covered with woods but boasts a rich history. Archaeological remains stand side by side with the restaurant that was very popular with Hollywood movie stars back in the 1960s. Motorboats run regularly from the shore of Ossuccio (near the bell tower next to the Antiquarium Museum). Boats run regularly to and from Como. Up north, the Mera and Adda rivers offer a glimpse of riverine life, while to the south, the Adda River flows over the plain across the homonymous park, which is also a vast natural reserve. The typical Leonardo da Vinci ferry boat can be seen in Imbersago. Bathing is not allowed everywhere in Lake Como. However, to believe that the lake waters are always filthy is a result of bad rhetoric: the large amounts of floating debris that can be seen after a thunderstorm are mostly made up of lumber swept down from the woods by the rain. A visit to the relics of the "Plinio", an ancient paddle steamer that sunk in 2010, is surely one of the most enthralling scuba diving experiences of all. The relic is regarded as the “Titanic of the Lario” and lies at the bottom of the lakelet of Mezzola, in Verceia (a few km north of Colico) at a depth of 45 meters. Scuba diving is difficult here due to the low temperatures but experts say it is worth a try! They can be found in Como, Cadenabbia, Menaggio, Gravedona, Bellano, Cernobbio, Bellagio (without swimming pool), Lenno (without swimming pool). Lario was one of the centers of the spreading of Christianity. Without minimizing the importance of the churches of Como, the church of S. Maria del Tiglio in Gravedona surely played a prominent role. Still in the upper lake region, the Piona Abbey is a very popular tourist destination, also reachable by boat from Como (trip lasts about 4 hours). Situated on the southwestern branch is the devotional complex of the Sacred Mount of Ossuccio (inscribed under the UNESCO World Heritage List), the Madonna del Soccorso sanctuary and the chapels of the Via Crucis, dotted along the path that starts from the renowned bell tower of Ossuccio. Close by is the Abbey of Acquafredda (easily reachable from Lenno) from where the path that leads to the desolate monastery of S. Benedetto in Val Perlana starts. The church of S.Giovanni and the archeological sites located on the Comacina Island are reminiscent of the wars that raged throughout Lombardy in medieval times. The Romantic Movement elected Lario as one of its paradises. Many renowned literates and musicians from all over Europe sojourned in most of the sumptuous villas. Their memory, or better, their “spirit” still lingers over those places today. Literary ghosts are said to haunt Villa Pliniana, the ideal setting for overwhelming stories of love and death. Nocturnal mysteries permeate the towns of Blevio and Moltrasio evoking the secret love affair between Vincenzo Bellini and the famous soprano Giuditta Pasta (whose ghost is said to have appeared in Villa Da Riva). The Grosgalli cliff between Bellagio and Lezzeno (Villino Folletto - "Pixie" in English - , Villa Lucertola - "Lizard" - , Ponte del Diavolo - "Devil's Bridge") recalls medieval legends associated with witchcraft. A visit to the castles is a must: the Castle of Vezio, in Varenna (reportedly haunted by the ghost of Queen Teodolinda) and Baradello (in Como) linked to the tragic death of Napo Torriani who was put in a cage and left there until he died. Last but not least, Villa De Vecchi, situated in the woods of Cortenova in Valsassina (Lecco) and regarded by the American website BuzzFeed as one of the seven most haunted places in the world. It is difficult to imagine Lake Como without its mountains. Tourists can choose from a wide variety of excursions, as long as they are willing to do without hotels and light rail service (the mountain tops are solitary and you need to leave the car at the foot of the mountain and then continue by foot or mountain bike). It is always warm in summer even at higher altitudes and we suggest setting off on a trip on a clear sunny day to enjoy the breathtaking views. - Destination: Church of S. Martino. A walking trail with an amazing view over Bellagio, ideal for families with children (altitude: 475 m; by car, starting from the shore of Cadenabbia in the direction of Griante; parking lot in Piazza S.Rocco). - Mountain huts of Brunate. A long but easy walk with stopover at a local hut for lunch. The funicular railway takes you from Como up to the Faro Voltiano lighthouse (open on Sundays, bus timetable Brunate-Faro Voltiano) and to Mount Boletto and Mount Bollettone (respectively 1236 m and 1317 m). The local huts Carla, Bondella, Bollettone and Mara are located along the way. - The mountains of Lenno. A funicular railway runs from Argegno to Pigra (funicular timetable). From there you continue on foot towards the mountain huts Alpe di Colonno, Boffalora and Venini (Mount Galbiga, 1698 m). This itinerary can also be covered by car starting from Argegno and travelling through Valle d’Intelvi in the direction of Pigra. - Destination: Mount S. Primo, above Bellagio (1682 m, packed lunch). Departure from the parking lot of the astronomic observatory of Colma del Piano, along the road that runs from Nesso to Zelbio, Sormano and Pian del Tivano. You can enjoy a geometric perspective of all three lake branches. - Mountain Refuge of Menaggio (1400 m). Departure from Menaggio in the direction of Plesio; parking lot in Breglia. - Mount Berlinghera (1930 m; packed lunch). Departure from Gera Lario headed to Bugiallo - S. Bartolomeo. Marvel at the spectacular view over the far end of the lake and the Chiavenna Valley. - Mount Legnoncino (1711 m; packed lunch). Departure from Dervio in the direction of Tremenico; parking lot at the Roccoli-Lorla Refuge. - The Tracciolino. Departure from Verceia (Lake Mezzola). - The suggestive mountains of Lecco (Mount Resegone, Mount Barro and Mount Moregallo) have morphological features that recall their dolomite origins. - Destination: Mount Bregagno (2107 m; packed lunch). Departure from the Menaggio Refuge. - Mount Crocione (1641 m; packed lunch). Departure from the village of Intignano above Tremezzo. - Mount Legnone, the “sacred mountain top” (2609 m, packed lunch). Departure from Dervio in the direction of Tremenico; parking lot at the Roccoli-Lorla Refuge. It is possible to practice rock climbing at a professional level. The Grigne group (2400 m), a range of mountains characterized by impressive spires and pinnacles, is the ideal reference point for rock climbers (known as the "Spiders" of Lecco) that come from all over Lombardy. Likewise suggestive are the austere mountains of the Valtellina region, including Sasso Manduino, which stand as solemn "sentinels" of the far end of the lake. Please consult more detailed guide books for information about itineraries and the various difficulty levels (Lombardy mountain refuges, Lecco). A pedestrian trail about 10 km long that runs from Colonno a Tremezzo. It winds up and down through various towns along the way. You set off by car along the slope before Colonno and you can park just past the first big curve (wide availability of free parking spaces). - A cycling trail that skirts the lakeshore between Menaggio and Sorico. It includes numerous stretches of unprotected lanes (for expert amateurs only). Cycle lanes that skirt the lake waters in Cremia, Pianello, Musso, Dongo, Domaso, Gera, Sorico. - Situated at the northernmost tip of the lake, the oasis of Pian di Spagna offers a variety of unpaved trails and riverside paths immersed in nature. Bike rental available at all campsites. Eco-noleggio Como Lake (Colico). Associazione Pedaleggiando (Pian di Spagna). Cycle lane Alto Lario Occidentale (Domaso-Sorico). - The lon g cycling path of the Adda Park starts at the southern end of Lecco and follows the river as it flows across the Padan Plain. - About 10 km of unprotected road that stretches from Como to Laglio can be covered without any particular problems. It is the old Regina road, much less trafficked now after the construction of the new Regina road. The itinerary starts from the walking trail of Villa Olmo and continues towards Laglio (the trail runs past George Clooney’s villa). - Bike rental: available at almost every hotel, hostel and camping site. Bike rental services: Municipal Bike Sharing stations - Como (see below); Garage Jasca, Piazza Volta 42 - Como; Autosilo Comunale, Via Auguadri - Como; Rullo Bike, Via Grandi 17 - Como (closed on holidays); Run and bike, Via Borgovico 161 - Como (closed on holidays); Guti Rent Bike, Argegno; Crossing bike, Corso Bergamo 69 - Lecco (closed on holidays); Eco-noleggio Como Lake, via Montecchio Nord 10 - Colico; Associazione Pedaleggiando, Via V.Emanuele 41- Sorico; Bicisport2000, Via Rima 4 - Lenno (closed on holidays); Leonardo da Vinci ferry boat station, (Imbersago). - Electric bike rental: Garage Jasca, Piazza Volta 42 (Como) - Hotel Il Perlo (Bellagio). One-day ship cruises: A regular ship service has been running for two centuries now and is a part of Lake Como’s history. It is managed by the state government and includes a fleet of motor ships, hydrofoil, car ferries and old steamships. Longer routes run to and from Como with morning departure and evening return (possibility of stopovers in the desired localities). - Discounts and facilitations: Cumulative season tickets valid for 24 hours are available for all boat lines. All-in-one tickets issued only in the spring-summer period include free access to boats and one entrance to one of the parks of the villas. Info at Navigazione Laghi. - Short cruises by motorboat: One-hour sightseeing tours from Como, every day even in winter (Taséll). - Manzoniano Tour: Departure from Lecco on summer weekends, sightseeing trips by motorboat to explore the places described by Alessandro Manzoni in his novel The Betrothed (Tour manzoniano). - Characteristic transport: "Concordia", the only paddle steamer in Italy today that currently runs a regular service. Other transport services available: the paddle steamer "Patria" (mainly available for rentals and special events), the funicular railway Como-Brunate, the funicular railway Argegno-Pigra and the hydroplanes of Aero Club Como (the first hydroplane pilot school in the world). - Floating Disco-bar: The Bisbino Pub, on board of the old Bisbino boat anchored at the dock of Tremezzo (Pub Bisbino). - Larian Boat Museum (Pianello, Via Regina, 139): Museo della Barca Lariana. - Museum of Nautical Equipment (Bellagio - S.Giovanni - Piazza Don Miotti): Museo degli strumenti nautici. Musultin, a traditional dish based on allis shad is a must-try! This fish is caught in springtime, then sun-dried and stored for several months in jars called “missoltas” along with bay leaves. It is normally grilled and served with polenta and red wine. Miascia, another typical dish, is a cake prepared with stale bread with the addition of milk, eggs, sugar, butter, apples, pine nuts, raisins, amaretto biscuits, dark chocolate and lemon rinds. Resta, a traditional cake from Como usually linked to the Easter period, has an olive twig hidden inside the dough. Toc is a typical polenta dish from the mountains of Bellagio, seasoned with butter and cheese. A complicated recipe, not particularly easy on the stomach! We must not forget pizzoccheri, ribbon-shaped pasta made from buckwheat. This famous pasta dish is typical of the Valtellina region, deep in the heart of Northern Italy (province of Sondrio). - Easter. Como: Traditional Easter market stalls. During Easter week you can see hundreds of exhibitors from all over Italy crowding Viale Varese. - June. Comacina Island: The Feast of San Giovanni takes place during the weekend nearest June 24. It is celebrated with Saturday night fireworks, a majestic boat parade that sets off from Como and a festival that takes place on the island on the following Sunday. It is the most important and emblematic event in Lake Como. - Summer. Festival of Bellagio and Lake Como. Itinerant classical music concerts. - Summer. Villa Carlotta (Tremezzo): Villa Carlotta concert season. Classical music concerts for piano and small orchestra inside the villa. - July 4. Villa d'Este (Cernobbio): A small fireworks display for the delight of American tourists. The event is replicated on the 14th of July to commemorate Bastille Day. - August 15. Varenna and Gravedona: Traditional mid-August firework display. - August 31. Como: Feast of the Patron Saint at the church of S.Abbondio. A gastronomic festival is held during the weekend. - August/September. Como: "Parolario": A cultural event that sees the participation of writers and journalists of national renown. - August/September. Como: APT Challenger Como, a professional tennis tournament that takes place in Como. The event is part of the ATP Challenger Tour. - August/September. Como: Palio del Baradello. Games, concerts and historical parades in medieval costumes. The event commemorates Frederick Barbarossa and the battles that raged throughout Lombardy during the medieval period. - September. Villa d'Este (Cernobbio): the Ambrosetti Forum, which sees the participation of leading exponents of the finance sector. The F1 Italian Grand Prix takes place at the same time in the nearby town of Monza. Thanks to this event, the total turnover generated by the related industries of the Como area amounts to around 3 million Euros. - September. Como: Powerboat Gran Prix of Italy, valid for the world championship. - September. Como and surrounding province: Giro di Lombardia (Tour of Lombardy), a famous cycling race starting from Bergamo with arrival in Como or vice versa. - The theatrical season of the Social Theatre kicks off in autumn: operas, concerts and all kinds of shows. - October. Villa d'Este (Cernobbio): "Orticolario", an important event dedicated to flowers and gardening. - October. Como and surrounding province: Rally car race valid for the WRC Italian Championship. - October. Palanzo (Faggeto): Sagra del Torchio. The ancient press (torchio) that dates back to 1575 and is considered a national monument comes back into operation on this occasion. Don’t miss the market stalls and the typical products on display. - December. Como: Magic light festival. All the monuments light up and the New Year’s Eve party takes place along the lakefront. This event is linked to "Como, the Land of Toys" festival, during which a skating rink and play spaces for children are specially set up (open until January 6). - December: Artigiano in fiera, Milan, Rho Fiera. - December 31: New Year's Eve ship cruise, including dinner and dancing on board. Departure from Como. The dialect of Como/Lecco is similar to that spoken by the Milanese people, although with numerous differences that can be understood only by experts. The broad dialect spoken by Lake Como inhabitants is similar to that spoken in the Canton of Ticino, the so called laghee dialect, recently brought to the forefront by Italian singer/songwriter Davide van de Sfroos. The best time to visit Lake Como is during the summer. Spring and autumn are the best times for admiring the flowers and the colourful gardens. The mountains are covered in snow from November to March and this is the best time for practicing winter sports. Unfortunately, the parks of the villas, the campsites and the majority of the hotels are closed during this period. It should be noted that, despite the presence of olive trees in several localities, winter is not as mild as it is often described. Also, boat services are limited during the winter season. Weather forecast: Lombardy weather (English US, °F), MeteoComo (°C). - Train: Como is served by two railway lines: Ferrovie dello Stato and Ferrovie Nord Milano, both unified and managed today by Trenord. Trains run frequently to and from Milan and the travel takes between 35 minutes to one hour. The most convenient train station is Como Lago, close to both the lake and the Cathedral. It takes just one hour to reach the railway terminus of Piazza Cadorna in the center of Milan (paper timetable). Rapid trains depart from the station of S. Giovanni, terminus of Central Station or Porta Garibaldi (located quite far from the center) and run up to the late evening. The train route crosses the eastern end of the Padan Plain - the Brianza region - with stops at every station, just like the subway. The suburbs of the “endless city” alternate with cultivated fields in the area between Lomazzo and Saronno, not to mention the woods of the Lura Park. The entire eastern shore from Lecco to Colico is served by the Milano-Lecco-Colico-Sondrio line. - Car: The travel time on the A9 Milano-Como highway is half an hour. 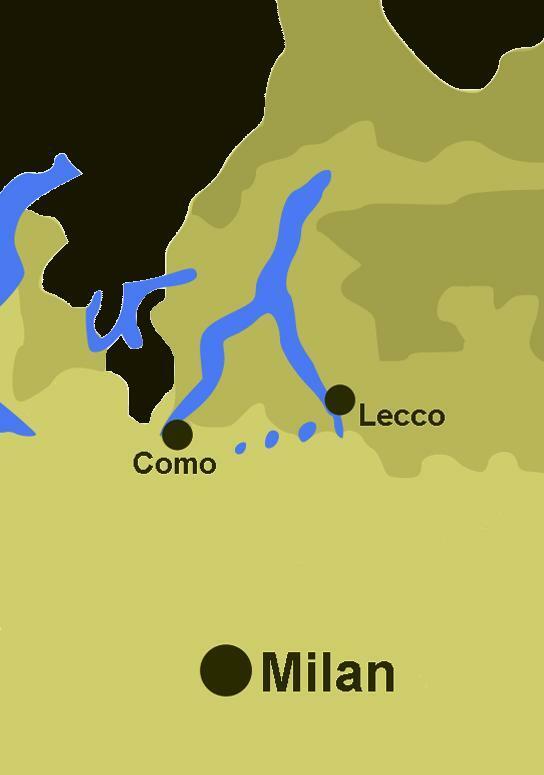 Lecco is linked to Milan by State Road 36. - Airplane: The Milanese airports of Malpensa and Linate are close by. It is not advisable to travel the narrow roads around the lake by campervan, caravan/trailer or grand tourism bus. It is better to go by boat, car or motorbike (long distance bike tours are recommended only for experts and amateurs). Traffic jams and queues should also be taken into account. The following five destinations are a must-see during your first visit to Lake Como: Como, Bellagio-Villa Melzi, Tremezzo-Villa Carlotta, Lenno-Villa Balbianello, Varenna-Villa Monastero and Menaggio. At least a dozen itineraries offer the possibility of discovering Lake Como’s lesser-known treasures: Strada Regia, Sentiero del Viandante (The path of the wanderer), the upper side of the walking route from Urio to Laglio, the tour of the three churches of Pognana, and much more. The beauty of these sites lies in the fact that they are hidden away from the mainstream and the challenge is to discover them as you go! Como, the lake’s capital town, has a population numbering 85,000 and a history that goes back nearly 3,000 years. It is a university town as well as an industrial center (the finest silk in the world is woven here). It is 40 km far from Milan and it shares its borders with Switzerland. The city has countless potentialities but the character of its inhabitants has always made it difficult to balance its tourist offer and Lombardy’s industrial tradition. As history would have it, tourism development took place in the villages that surround the lake rather than in the capital town. As a result, a few things concerning its organization, urban fabric and the mentality of its inhabitants altogether need some rethinking. The Tourist Information Office is situated near the Cathedral (Via Albertolli), and is open every day from 10.00 a.m. to 6.00 p.m. Other info office are found at S. Giovanni central station. Como is the birth place of Pliny the Elder and Pliny the Younger (two illustrious figures in ancient Roman society), Alessandro Volta (inventor of the first electric pile - the forerunner of the modern power generator), Cosima Liszt Wagner (daughter of Franz Liszt and wife of Richard Wagner) and Antonio S. Elia (greatest exponent of Futurist architecture). Como is the Italian capital of Rationalist architecture and its Cathedral is one of the most important in Northern Italy. Also of great interest are the medieval square of Piazza S. Fedele, Porta Torre, the ancient defensive walls, Piazza Verdi with its three adjacent monuments (Palazzo Terragni, the Social Theater and the apsis of the Cathedral). The church of S.Abbondio (video), one of the most beautiful Italian basilicas built in Romanesque style, is located outside of the city walls. The Cathedral is close to Piazza Cavour, the square that literally separates the western shore from the eastern one. The eastern shore, from where spectacular sunsets can be admired, leads to the attractive walking trail of Villa Geno dotted with outdoor restaurants, as well as to the funicular railway and the Ferrovie Nord Milano station. The western shore instead takes you to the public gardens, to the dyke of the harbour, to the new monument built by the American architect Daniel Libeskind and other important monuments, such as the Voltian Temple (the museum where the mementos and relics of Alessandro Volta are conserved), the War Memorial (a masterpiece of Futurist architecture) and Villa Olmo. A walk in the park of Villa Olmo is one of the most romantic experiences of all, especially at night. The town center streets are completely pedestrianized. - Bike Sharing: There are at least a dozen municipal bike sharing stations (subscription required-season tickets available online or directly at your hotel). Enjoy a bike ride on a brilliant sunny morning along the path towards Villa Olmo and Tavernola. - Multi-storey car parks in the town center: Centro lago (Via Recchi at the corner with Via S.Elia, open 24/24, 515 spaces) - Valduce (Viale Lecco, open 24/24, 515 spaces) - Comunale (Via Auguadri, closed at night, 800 spaces, bike rental) - Università (Via Castelnuovo near the University, open 24/24, 450 spaces). - Low cost multi-storey car park outside the town center linked by buses running every 5 minutes: Valmulini (Via Napoleona with deviation towards Via Mulini, closed at night, 630 spaces, € 2,50 per day). - Buses: The bus station is in Piazza Matteotti opposite Como Lago train station. E-tickets are available. Paper tickets can be purchased at the bus station in Piazza Matteotti and at several bars. They can also be purchased on board. - Equipped campervan parking lot in Via Aldo Moro. It can currently host 4 campers and is equipped with wastewater disposal and electrical chargers. Cost: € 0.50 per hour. - Historical center and shopping district: Piazza Cavour, Piazza Duomo, Piazza Verdi, Piazza Volta, Piazza S. Fedele, the medieval walls and the main shopping streets (Via Vittorio Emanuele, Via Luini, Via Cesare Cantù and the ancient streets of Via Vitani and Via 5 Giornate). The top storey of the Coin megastore in Piazza Duomo has a rooftop terrace that offers a spectacular view over the Cathedral in summer. Shops are open every day except Sunday. - Trips across the first basin by motorboat offer the possibility to admire the spectacular villas along the coast from Blevio to Cernobbio. Departure from Piazza Cavour. Trip lasts one hour. - Ship cruises (departure from Piazza Cavour). - The funicular railway leads up to the town of Brunate (715 m). From there you can continue by foot or by bus up to the Faro Voltiano lighthouse (open on Sundays). On a clear, sunny day you can enjoy a stunning view over the skyscrapers of Milan with Mont Blanc in the background (bus timetable Brunate-Faro Voltiano). Attention: please note that the city’s panoramic point is not indicated. To enjoy the view, as soon as you get off the cable railway, take the opposite direction (go down the stairs, don’t climb them like everyone else, then go past the restaurant, cross the main street, keep left and take the first little road that slopes downwards). - Aero Club Como hydroplanes (the Club does not operate hydroplane services for tourists but trial flights are available upon request). - Voltian Temple dedicated to Alessandro Volta and visited by Albert Einstein, Viale Marconi, 1 (opening hours: Tuesday-Sunday, 9.30 a.m. - 6.00 p.m.). - The Historical and Archaeological Museum “Paolo Giovio”, Piazza Medaglie d'Oro, 1 (same opening times). - Pinacoteca Civica (Civic Art Gallery) inside Palazzo Volpi, Via Diaz, 84 (same opening times). - Museo della Seta (Silk Museum), Via Castelnuovo, 9 (closed on Saturdays and Sundays). - Villa Olmo, seat of important summer exhibitions. - to Castel Baradello situated at the top of the hill (alt. 430 m); departure from Piazza San Rocco or Piazza Camerlata. The tower of the castle is open to the public on Saturdays and Sundays from April to September. - Mount Croce (alt. 500 m), from where you can admire an amazing view over an urban landscape which is said to be one of the most spectacular in Europe. Departure from the church of S. Abbondio in the direction of Croce di S. Eutichio. - George Clooney’s villa, situated in Laglio about 10 km away from Como. Cyclists can cover this distance by taking the old Regina road that runs past the villa. Como has a temperate/continental climate, humid with hot summers and cold winters. Snowfalls are sporadic but occur at least once a year. The lake is crowded with people in summer while in winter, the major tourist attraction is the historic centre, in particular during the Magic Light Festival that takes place in December. The town center is always crowded with shoppers in the afternoon, especially on Saturdays. There are very few nightclubs and nighttime in the center is quiet. 12-hour train and boat tour: You can visit Como and one of the little towns of the central lake area in one day, normally Bellagio. After spending the morning in Como, you can take the 12.00 p.m. ship with arrival in Bellagio around 1.50 p.m. (if you are lucky you can even catch the paddle steamer, Steamboat Grand Tour). You can use the hydrofoil Rapid Service on your way back. - If you want to stay in town and enjoy the lake at the same time (for example, a tour around the historic center, a visit to Villa Olmo and a ride on the funicular), you can set off on a one-hour motorboat trip across the first branch of the lake and sail along the coastline to admire the many villas, including Villa d’Este. Buses make regular departures from piazza Cavour. Alternatively, you can visit Cernobbio and Torno by ship (ship service runs regularly and the trip just lasts 15 minutes). - 2/3/4-day tour: Of course, the itinerary depends on the place where you want to spend the night. Keep in mind that the most popular destinations are: Tremezzo-Villa Carlotta, Varenna-Villa Monastero, Lenno-Villa Balbianello. These towns can all be reached by ship. - Easiest alternative route: You can reach the central lake area directly from Milan by taking the train that runs along the Milan-Lecco-Sondrio railway line (departure from the Central Station or Porta Garibaldi station) and get off at Varenna. In this way, you can reach the most popular tourist destinations without having to change trains. From Varenna you can take a boat to Bellagio, Menaggio or Tremezzo; the trip only lasts 15 minutes. Como is not included in this tour but you can make a stop there if you plan a three-day trip, for example. You can reach the city by ship in around two hours. It takes less than one hour by hydrofoil (the ship is surely the most suggestive way to get there). - Car/motorbike tour: You can reach all the other destinations by your own means. Negative notes: the only drawback is not enough parking spaces and the risk of being caught in a traffic jam. Without a doubt, the best way to tour Lake Como is by motorbike. In your itinerary we suggest you include the hamlets situated on the south-western branch of the lake. Western shore: The Comacina Island (with departure from the village of Sala), the nearby bell tower of Ossuccio with the Antiquarium Museum, the old houses of Argegno and Brienno (a panoramic cable car runs from Argegno to Pigra), George Clooney’s villa in Laglio, the elegant town of Cernobbio with Villa d’Este close by. Eastern shore: The Nesso ravine with the medieval bridge and the old villages of Careno, Pognana and Torno. If you have enough time, you can tour the north region of the lake aswell. The upper lake area is most popular with tourists in the summer thanks to well-equipped camping sites that offer the possibility to practice many sporting activities completely immersed in nature. To sum up, sites worth visiting include: Rezzonico (a typical seafaring village), Pianello and Dongo with their gravel beaches, the church of S. Maria del Tiglio in Gravedona (one of the most important Romanesque churches in Lombardy). The Piona Abbey (open to the public) and the medieval hamlet of Corenno Plinio rise on the eastern shore. The lakeshore of Dervio that runs through the camping site (a great place for a picnic on the meadow) and the Bellano ravine are also worth visiting. If you are a nature lover, you will find your paradise at the far northern end; you can rent a bike at the natural oasis of Pian di Spagna (the most interesting oasis in Lombardy) and skirt the small lake of Dascio and the Mera and Adda rivers. - A car-ferry service runs between Cadenabbia, Menaggio, Bellagio, Varenna. - The Lecco area, although it is less attractive tourist-wise, is worth a visit for its equipped beaches (Onno), the town of Lecco and the Adda river (southern side). - The view on the lake from the mountains is surely not to be missed, and to enjoy it without having to engage in long walks, you can choose from one of the itineraries below: The aforementioned Volta Lighthouse, the Argegno-Pigra cable car, the roads that climb up respectively from Bellagio to Civenna and from Menaggio to Plesio, and the road that stretches from Varenna up to Vezio (with a stop at the Vezio Castle which offers panoramic views over the Lake). - Complete tour around Lake Como: 170 km by car or motorbike: Due to the distances and the great number of attractions, it is not possible to tour the most beautiful lake in the world all at once. However, if you are travelling by motorbike and love the open road, this is the perfect trip for you, provided you stop at least one night to have the time to do some sightseeing! Itinerary: Como-Colico-Lecco-Bellagio-Como. It is better to avoid tunnels and expressways and travel the ancient roads that run along the coast. Suggested stopovers: Como, Cernobbio, George Clooney’s villa in Laglio, Brienno, the bell tower of Ossuccio in front of Comacina Island, Lenno-Villa Balbianello, Tremezzo-Villa Carlotta, Menaggio, Rezzonico, the beaches of Pianello and Dongo, the Mera and Adda Rivers, Colico, Corenno Plinio, Dervio, the Bellano Gorge, Varenna-Villa Monastero, Moto Guzzi headquarters (Mandello), Lecco, the beaches of Onno, Bellagio-Villa Melzi, the Nesso Gorge, Careno, Torno. - Panoramic detour up in the mountains: from Bellagio in the direction of Civenna, Madonna del Ghisallo, Canzo. No tour to Lake Como would be complete without a visit to this big city. In fact, the characteristics of both sites attract each other: on one side, the charm of nature, and on the other, the throbbing pulse of life as the antidote to provincialism and ultimate reference point. The hidden power of Milan permeates the most part of Italian society.With its lively ambiance, this city is truly about the lifestyle of enjoying worldly pleasures: strolling, sightseeing, shopping and meeting with friends (to say it with the "Touring Club Guide of Italy"). As you wander the streets of Milan, you will marvel at its atypical historic centre replaced by a seamless blending of multiple architectural styles open to change of whatever kind. Do not go in search of the “old” Milan alone; its “modern side” (or even a combination of both aspects), is equally worth discovering. In fact, the Lombardian city is far from the ancient and picturesque representation typical of other Italian cities. As mentioned in the photo gallery section, Milan’s historical heritage is concealed by the “anxiety of the present”, right at the core of one of Europe’s productive hearts, which somehow takes away that folkloristic, naïve touch that always sparks off a sense of congeniality. As a result, Milan has to pay the price of unpopularity, more in Italy than elsewhere, unfairly becoming the stereotype of “ugliness”: harsh, modern, far from the sea, sweltering in summer and gelid in winter. It seems hard to convince Italians that Milan is the only city in Italy that is able to stay in line with Europe and all the novelties coming from abroad, and play a role in the world without having to rely on the past. It should be reminded that treasures of art of outstanding universal value are hidden among the skyscrapers, not to mention the magnificent lakes that dot the surrounding areas. We suggest going by train (by car, you are likely to get lost in a labyrinth of narrow, one-way alleys). As said before, the most convenient train station is Como Lago, just an hour away from the railway terminus in Piazza Cadorna. Anyway, Piazzale Cadorna is an ideal point to begin a tour of the city, regardless of where your hotel or departure point is located. It is almost impossible to tour Milan all at once, so we can only draw up a hypothetical itinerary. We propose a main itinerary (Tour A), highlighting three possible detours in blue color. The Last Supper of Leonardo da Vinci, the basilica of Sant’ Ambrogio and the Navigli district are dealt with in Itinerary B. The tour of the skyscrapers is included in Itinerary C.
- Equipment needed: a road map, a pair of comfortable sneakers and a great passion for walking! - Best Period: All year round expect for August when shops are closed, unless you are willing to explore Milan at an unusually quiet time. Autumn is the best time for shopping, particularly during the Christmas season. January - generally cold in Milan - is also a good time for bargain-hunting. It is best to avoid the hottest periods in summer. Milan celebrates Sant’Ambrogio’s feast day as a public holiday on December 7 with the inauguration of the lyric season at the Scala Opera House. Another highlight of the day is the Oh Bej Oh Bej street market. - Discounts and facilitations: Cumulative 3-day tickets for all the Civic Museums or a 1-year ticket (MuseoCard), which can also be purchased online without the need to print them out (info at: Milan Tourism). - Bus panoramic tours (City Sightseeing): info at City Sightseeing Milano. - Detailed info: Milan Tourism. - Weather forecast: Milan weather (English US, °F), Meteo Milano (°C). MAIN ITINERARY (A): CADORNA - CATHEDRAL – LA SCALA - CORSO BUENOS AIRES. This is the classical shopping tour that includes visits to the most important monuments of Milan. It runs west-northeast across the city center. From the station in Piazza Cadorna we head towards the Sforza Castle to the left, with the vast square parade ground known as Piazza d'Armi at the center. The Castle hosts a dozen important permanent exhibitions, amongst which the Museum of Musical Instruments, the Museum of Armoury and the Museum of Ancient Art (where the Rondanini Pietà by Michelangelo is on display). Sempione Park extends northwards where the Aquarium and the Branca Tower are located (the Tower is 108 m high and offers a stunning view over the city). The vast park is delimited by Napoleon’s Arch of Peace. The Castle overlooks Largo Cairoli to the south, at the intersection with Via Dante, an elegant pedestrian street. The buildings of Piazza Cardusio with their beautifully decorated facades are home to banks and insurance companies, just a few minutes away from Piazza Affari, seat of the Italian Stock Exchange. Visitors might find it difficult to distinguish between a tourist and a businessman: every day a multitude of brokers mingle with tourists on their way to the Cathedral, perhaps in the attempt to squeeze in a lunch break in one of the many coffee bars along Piazza Cordusio. -	DETOUR 1: Business District and Ambrosiana Palace. The Italian Stock Exchange is situated in Piazza Affari, reachable from Via Casati, Via Negri (to the right). It is located inside Palazzo Mezzanotte, in front of which stands a curious sculpture by Maurizio Cattelan, an enormous fist giving the single finger gesture. Who can tell whether it is directed at the people or Capitalism? As we move further down, we end up in Milan's financial heart in the midst of the imposing baroque-style buildings that line Piazza Edison. You can catch a glimpse of Casa Broggi at the end of Via S. Maria Segreta. We continue along Via Armorari until reaching Via Cesare Cantù, with the Ambrosiana Museum on the right. Several masterpieces of Leonardo, Caravaggio, Tiziano and Raffaello are on display here. The Ambrosiana Library at the back overlooks Piazza San Sepolcro. It is home to a collection of around 45,000 books, including Leonardo's Atlantic Codex and the famous Virgil manuscript owned by poet Francesco Petrarca. From Via Dante we reach Via Mercanti and the adjacent square Piazza Mercanti, the only medieval part of Milan and ancient commercial heart of the city. Take some time to admire Palazzo della Ragione (the upper floor alone is occupied by a 1000 m² hall), Loggia degli Osii and Palazzo delle Scuole Palatine. From there we proceed towards Piazza Duomo. The tourist office is situated at the corner with via Marconi. We cannot miss a visit to the Cathedral roof terraces; on a clear sunny day you can enjoy an overwhelming view of the Alps framed by the Gothic spires of the Cathedral and the imposing skyscrapers. On the south side of Piazza Duomo we find the museums of Palazzo Reale and Palazzo Arengario, home to the 19th Century Museum. The Mondadori Megastore, a bookstore richly furnished with stationary items and accessories, is located under the Arengario portico, right next to the Martini skyscraper. This building boasts the most exclusive rooftop terrace of Milan situated on the 15th floor (open to the public on the occasion of events), while the crossroads with Via Torino is one of the most bustling points of the city. An extremely interesting itinerary could start off from here. Enjoy the magnificent window displays as you walk along Via Torino, then continue up to the historical columns of S. Lorenzo with the typical small shops nearby until you reach the Darsena and the Navigli District. Resist temptation, stay in Piazza Duomo and enjoy some sightseeing. On the north side is the entrance to the Vittorio Emanuele Gallery, the splendid "salon of Milan". On the occasion of Expo 2015 a panoramic path has been created on top of the roof and encircles the 19th-century dome made of glass and cast iron (access to the elevators from Via Silvio Pellico, 2). The Gallery leads you right in front of La Scala Opera House and Palazzo Marino, Milan’s town hall. Unless there is a performance taking place, La Scala - considered the universal temple of music - is closed to the public. However, it is possible to visit the adjacent museum. Palazzo Marino hosts itinerant art exhibitions. - DETOUR 2: Brera and surrounding area. From La Scala we take Via Case Rotte and head towards Via Omenoni. Along the way to Palazzo Belgioioso we can admire the 15th - century statues that decorate the façade of Palazzo Omenoni (Via Omenoni 3). Further down the street, in Via Morone, stands the Alessandro Manzoni Birthplace Museum. At the intersection with Via Manzoni (No.10) stands Palazzo Anguissola, named after Giovanni Anguissola, the great-grandson of the governor of Como who built villa Pliniana. At No. 12 we find the Poldi Pezzoli Museum that hosts a rich private art collection (open to the public) including works by Michelangelo, Canaletto, Botticelli, Hayez and many others. As we make our way back to La Scala, we turn left in Via Clerici and pass the palace owned by Giorgio Clerici (builder of Villa Carlotta in Tremezzo) and the Arazzi Gallery frescoed by Tiepolo. We turn right into Via Verdi and head towards Via Brera, the old "bohemian" district of Milan. At the corner between Via Verdi and Via Manzoni once stood the 18th - century Cova Café (now located in Via Montenapoleone) frequented by eminent exponents of the cultural world and patriots of the "Risorgimento". As we walk along Via Brera, at the corner with Via Monte di Pietà we find the building where Alessandro Volta sojourned from time to time. Giacomo Puccini spent his last years at No.6 of the same street, while writer Carlo Dossi, a key exponent of the "Scapigliatura" movement lived at No.11. The Brera Academy is located further down the street. It is home to the Brera Art Gallery, which hosts one of the finest collections of paintings in Italy, and the Botanical Garden. From the observatory of Brera, Italian astronomer Giovanni Schiapparelli was the first to see canals on Mars, giving origin to the myth of the "Martians" (Astronomical Museum and Botanical Garden of Brera). Brera and Via dei Fiori Chiari, one of the heavens for nightlife lovers, are but a small part (together with Piazza del Carmine and its adjacent streets) of Milan’s fragmented historical center. From there we make our way back to the Cathedral. -	DETOUR 3: South end of Piazza Duomo. Via Arcivescovado leads you up to Palazzo Arcivescovile with its magnificent courtyard, near Piazza Fontana (where the only Renaissance fountain left in Milan stands). In Via Larga, the impressive Velasca Tower alone could take up an entire photo session. This skyscraper, unique of its kind due to its mushroom-like shape, was the first construction to symbolize modern Italy and its recovery from the ashes of World War II. We leave the Velasca Tower and head towards Piazza Missori, built in a contemporary style despite its vicinity with the Cathedral (many old neighbourhoods were demolished as a result of urban planning or destroyed by the devastating 1943 bombings). We continue towards Piazza Sant’Alessandro, dominated by the scenographic church that bears the same name. Further on, the bustling Via Torino is more like an outdoor shopping mall full of stores that display casual and teens clothing. From Via Torino we can reach the district of San Lorenzo (included in Itinerary B), and if we continue northbound, we end up back in Piazza Duomo. From Piazza Duomo we continue onto Corso Vittorio Emanuele, an elegant pedestrian street lined with gleaming boutiques and bars with late-night opening hours. La Rinascente and Excelsior, two massive 8-storey department stores (the latter is located inside Galleria del Corso) are surely worth a visit. La Rinascente has a rooftop restaurant that offers amazing views of the Cathedral spires, close to the fascinating Terrazza Aperol where you can enjoy your cocktail in glamorous and relaxing surroundings (next to the Vittorio Emanuele Gallery). The colonnade of San Carlo leads you straight into Piazza San Babila, dominated by rationalist-style buildings, which, together with Corso Matteotti and Corso Europa, contributes to creating an overall modern effect: a mix of Littorio (late-Fascist) and American styles, with the little church of San Babila almost hidden in plain sight in a struggle between the past and the present. At the corner with Via Durini rises the Brian & Barry Building, a 12-storey concept store with a panoramic restaurant that offers an all-round shopping experience. Here you can find jewels worth up to € 500.000. Further down the road, in Via Durini No. 20, stands the house that belonged to the famous orchestra director Arturo Toscanini. On our way back to San Babila, we take Via Montenapoleone, situated right in the heart of Milan’s fashion district” (the so-called "quadrilateral of fashion"), lined with Italy’s most exclusive boutiques. Via Manzoni is located right off Via Montenapoleone. Giuseppe Verdi died here in his suite in Grand Hotel et de Milan (No. 29). At the corner with Via Bigli stands the house that belonged to Countess Clara Maffei, who hosted one of the most prominent cultural salons of the mid 1800s. Via Manzoni ends under the arches of Porta Nuova. From here we can continue onto Via Manin where the former residence of Francesco Melzi d'Eryl - builder of Villa Melzi in Bellagio - stands (No. 21-23). On the other side we can admire Palazzo Dugnani, home to the Cinema Museum. Further down the street, in Piazza Stati Uniti d'America, is the Ca' Brutta, symbol of an architectural movement known as "Novecento" (1900s). The skyscraper area, to the north, is just a few minutes away. We will deal with it in Itinerary C.
On our way back towards Via Manzoni, we take Via della Spiga, of no lesser importance compared to Via Montenapoleone, intersected by Via Gesù where the magnificent Bagatti Valsecchi Palace-Museum stands at No. 5. Lovers of fashion and antique clothing can make a stop at the Costume, Fashion and Image Museum sited inside Palazzo Morandi, in Via Sant'Andrea No. 6. Finally we reach Corso Venezia, built in honour of Napoleon and devoted to military parades and "afternoon horse-drawn carriage rides". The street is lined with austere buildings in Liberty style, amongst which Palazzo Serbelloni at No.16, which belonged to the same family that built the homonymous villa in Bellagio, Rocca-Saporiti Palace at No.40, Castiglioni Palace at No.47 and Bovara Palace at No. 51 (former residence of French author Stendhal). At No.10 we find Casa Fontana Silvestri, the only Renaissance building still standing today in Milan. Halfway along Corso Venezia we find the Public Gardens where the Natural History Museum and the Planetarium are located. You can make a detour along Via Palestro to admire Villa Reale - a splendid neo-classical building - with its attractive lake. The villa, built in a typical Parisian style, is currently home to the Museum of Modern Art. We now turn right and pass under the arches of Via Salvini until reaching Piazza Duse-Via Cappuccini-Viale Majno, an area that best represents the Milanese Liberty style, characterised by splendid art déco buildings (in Via Barozzi there is a small private garden, home to several pink flamingos). At the end of Corso Venezia, Corso Buenos Aires - one of the world’s most exclusive commercial arteries - stretches out in front of you, lined with dozens of mid and low- price stores. It is good to know that in autumn, after sunset, the street lights up creating a magical atmosphere. Over the past centuries, the height of the buildings here was such as to allow an open view over Mount Resegone, near Lecco, completely out of sight today due to the city's voracious urban sprawl. The subway from Piazza Lima or Piazzale Loreto (red line No.1 headed for "Bisceglie") takes us back to Cadorna. ITINERARY B: THE LAST SUPPER - SANT’AMBROGIO - MUSEUM OF SCIENCE - SAN LORENZO - NAVIGLI. This itinerary includes several monuments of paramount importance, quite far from the Cathedral and the most elegant areas. Nonetheless, it is the ideal tour for those who want to breathe the atmosphere of the "old" Milan, even though the alleys, regrettably, are covered in tar and open to motorized traffic. Recommended once you have completed Itinerary A.
Firstly, from the station of Piazza Cadorna we head towards via Carducci and then continue onto Corso Magenta. The apsis of the church of Santa Maria delle Grazie appears in all its magnificence. The crypt houses the world's most famous painting: The Last Supper by Leonardo da Vinci (ticket/reservation). Next to the church, where the Atellani House stands, is a vast historical garden magnificently renovated in 2015: Leonardo's Vineyard. The vine which produced the grapes that Leonardo used to enjoy back in his day still exists today. After that, we go back to Piazza Cadorna and set off in the direction of Via Carducci No. 15, where the church of San Maurizio al Monastero Maggiore rises. This church complex is a typical example of underrated Milanese artistic treasure, also known as the "Sistine Chapel of Lombardy", with magnificent frescoes by Leonardo da Vinci's apprentices (amongst which Bernardo Luini) that cover its walls and ceiling. Further on we find the Archaeological Museum. Two Roman towers erected by emperor Massimiano stand in the museum's courtyard: the Ansperto Tower and the bell tower of San Maurizio, both accessible to the public. These are the only remains of the old Roman city walls that date back to the period when Milan was the capital of the Western Roman Empire (from 286 A.D onwards). As we make our way back to Largo Enzo Tortora, we can admire Palazzo Litta (17th century, now home to a theatre) on the opposite side of the street. We are now in Via Brisia. The remains of the old Imperial Palace erected by Emperor Massimiano should not be missed by lovers of Roman ruins. We turn right into Via Vigna and continue in Via S.Valeria. At the end of the street, two amazing building complexes appear in front of us: to the left, the cloister of the Catholic University (open on weekdays only) opposite the apsis of the church of Sant'Ambrogio, patron saint of Milan, whereas, beyond the War Memorial Garden (open on Wednesdays, Saturdays and Sundays) stands the symbol of Milan, the most ancient church in Lombardy dating back to the 4th century. - DETOUR: Museum of Science and Technology. Opposite Piazza Sant’Ambrogio, between Via Carducci and Via San Vittore, rises the fairy-tale Cova Castle (twin to Villa La Gaeta in Lake Como). Further on, in Via SanVittore No. 21, we find the Museum of Science and Technology. Located inside a monastery dating back to the 1500s, it hosts a world-renowned exhibition that spreads over a total surface area of 50,000 m². The Museum hosts a section entirely devoted to transport with several extraordinary items on display, including the command bridge of a transatlantic, several steam locomotives, the Toti submarine and a flight simulator. Back to Sant’Ambrogio, the arches of the Pusterla on the opposite side of the square open up in front of us. At the entrance to Via Lanzone, a marble plaque marks the place where poet Francesco Petrarca lived. As we continue along Via Lanzone, we pass in front of two interesting relics: the little church of San Bernardino and the 16th- century Visconti Palace (at No. 2). In Via Circo we can admire the rather sad ruins of a small Roman circus dating back to the 3rd century. Along Via Cappuccio, the superb Chiostro delle Umiliate stands quite out of sight. It is the cloister of an ancient monastery and is located inside Palazzo Litta Biumi (not always open to the public). We turn right into Via Sant'Orsola and head towards the ancient square of Piazza Borromeo. We can skip the Ambrosiana Art Gallery as it is already included in Itinerary A and turn directly into Via San Maurilio where we find the 16th-century Palazzo Greppi (No.9). At this point, Via Torino leads us back to the glowing atmosphere of the city with its vibrant shopping streets that converge into Largo Carrobbio. With our eyes fixed on the map, we turn into Corso di Porta Ticinese where we can admire a monumental complex of extraordinary historical value: San Lorenzo Maggiore. The complex is comprised of a Roman colonnade (the most important Roman ruins that can be found today in Milan) and the Basilica of San Lorenzo, the first church in Christian history to feature a central plan. To the side we can admire the typical stone arches that once delimited the old city, with the Porta Ticinese medieval gate. This is a relatively green area, at least according to the standards of the Milanese people, and lies quite close to the Navigli district. From Via de Amicis No.17 we access the Park of the Amphitheater (closed on Sundays) where we can admire the remains of a Roman theatre that had a seating capacity of 35.000, and a variety of prestigious trees species. The gardens of Parco delle Basiliche (behind Corso di Porta Ticinese) lead us straight to the Church of Sant'Eustorgio where the relics of the Magi were preserved in medieval times and then looted by Frederick Barbarossa. The Darsena, a stretch of water (really uncommon in an urban area) overlooks the pedestrian square of Piazza XXIV Maggio. The Darsena was restored and reclamated as an integral part of an Expo 2015 - related project and is now a place for relaxation. It features a small riverside area with boat storage facilities, outdoor cafés and a pedestrian promenade lined with trees. Do not miss a walk along Naviglio Grande, which becomes a center for nightlife during the summer. It crosses the district, perhaps the most typical of the “old” Milan, where many artisans and artists live and exhibit their works still today (Market of the Navigli). The tram (Line 3) from Piazza XXIV Maggio takes us back to the Cathedral. * ITINERARY C: THE SKYSCRAPER AREA. Milan is the "polar star" for lovers of modernism in Italy. Two of the most fascinating districts, architecturally speaking, include Porta Nuova, to the north, and City Life, to the west (the latter is currently under construction). Gallery: Milano panoramica. - Porta Nuova, located between the Central Station and Porta Garibaldi station. The itinerary develops along this trail: Piazza Gae Aulenti, Via Joe Colombo, Piazza della Repubblica, Via Vittor Pisani, Piazza Duca d'Aosta. We set off from Corso Garibaldi, the historical street that once marked the beginning of the road to Como. Bars, pubs and restaurants of all kinds can be found here, antique shops and still shows many traces of the "old" Milan, while the peaks of the new buildings that can be seen the distance reminds us of time’s passing. Piazza XXV Aprile creates a delightful contrast between the high skyscrapers and Porta Garibaldi, the ancient city gate (once known as Porta Comasina), which bears a plaque commemorating the medieval wars between Milan and Como. To the right stands Eataly one of the most renowned "Made in Italy" food courts in the city. Further on, Corso Como opens up with its many restaurant and discos, the throbbing heart of Milan’s movida. In the evening it is not rare to spot jet set personalities, models, football players and TV stars hanging out with the "businessmen of Piazza Cordusio", easily stalked like prey from the paparazzi, as was the case with the renowned "gym rat of Corso Como" (a.k.a. Fabrizio Corona). On top of this sophisticated world rise the buildings of the new Milan, included in the largest urban redevelopment projects in Europe in the 2000s. The result is an urban park featuring concrete, bricked areas embellished with green spaces, intended as a meeting point for social activity, open to anyone who believes in the future. Here stand the UniCredit Tower (231 m), the Solaria Tower (143 m, the tallest residential building in Italy), the shimmering Diamond Tower (140 m) and the Vertical Forest (111 m), all covered in plants and trees and ranked by International Highrise Haward as the most beautiful skyscraper in the world in 2014. These buildings are joined by a square (Piazza Gae Aulenti), several pedestrian paths (Via Joe Colombo, Via Mike Bongiorno) and wide gardens, including the Library of Trees (still under construction) designed by a Dutch landscape architect, featuring different groups of tree species strategically grouped together with a criss-cross of didactic paths populated by plants, flowers, vegetable plots, including the "Butterfly House", play spaces and fountains. Finally we reach Piazza della Repubblica, the largest square in Milan, surrounded by tall buildings, amongst which the Breda Tower (117 m). At the end of Via Vittor Pisani, a long, open boulevard lined with modern buildings with an American feel to it, toward the impressive building of the Central Station of Milan, which features a curious mix of Eclectic, Liberty and Littorio style. The historical Pirelli skyscraper (127 m, still considered today as a remarkable example of sophisticated architecture and prototype of numerous skyscrapers around the world including the MetLife Building in New York) is adjacent to the Station. Just a stone's throw away stand Palazzo Lombardia (160 m, new headquarters of the Lombardy regional authority, open on the first Sunday of each month). - City Life. This new district spreads northwards from Piazzale Giulio Cesare and occupies the old railway line of the former Trade Fair area (the Fair is now hosted at Rho-Pero, suburbs of Milan). The area is occupied by three skyscrapers, each with a distinctive shape, placed at the center of a vast green space destined to become one of the largest pedestrian areas in Europe, with 5 km of cycling trails. Each skyscraper has a unique shape: the Isozaki Tower (the "straight one", 242 m, the tallest building in Italy), the Hadid Tower (the "twisted one", 175 m, currently under construction) and the Libeskind Tower (the "curved one", 150 m, still in the design stage). To say it with architect Libeskind, thanks to City Life Milan will be reckoned as the "Gate of Europe". This area will see the development of a walk in the green, 1 km long and situated at a height of 7 m, similar to New York’s High Line. It will link City Life to the new Portello district. This project represents yet another building block for Milan, which is aiming to become a polycentric city of the future. Works are expected to be completed by 2018. Pictures, texts, videos and paintings by: Nicola Guarisco (Como 1973). Website technical realization: Matteo Guarisco. Pictures taken with a digital Olympus SP-510UZ, Olympus SH-21 and Canon SX620 HS (photos have been retouched by computer to adjust framing and luminosity, and also to create some effects of aquarelle blurring here and there). As for the paintings, subjects range from landscapes to personal portraits, realized with specific methods and slow procedures, and coloured watercolour pencil techniques on common paper size F4. The videos placed at the beginning of the video page contain music authorized by Youtube (or music which isn’t copyrighted) and were made completely by myself. 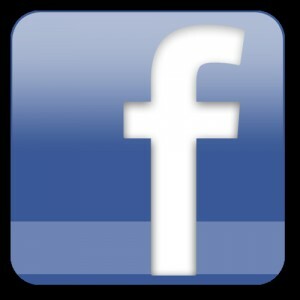 Images can be enlarged by clicking on them and downloaded for divulgative purposes. Their utilization for commercial purpose and text reproduction is forbidden. Internet Explorer and small mobile device may cause visualization problems.